Driver and firmware updates pushed out today to the Surface Pro 4 and Surface Book help fix some of the issues that have been frustrating users of both devices. Both models have had a sleeping problem. While traveling with your Surface Pro 4 or Surface Book, the device would not go into a deep enough sleep state while in standby mode. As a result, by the time you reached your destination, you would find that you had no battery life remaining on your Surface Pro 4 or Surface Book. In a blog post, Surface chief Panos Panay wrote that today's Intel driver and firmware update "will help you get the most of the power management options that Surface is designed to offer and continue to make your Surface more productive." To load the update on your Surface Pro 4 or Surface Book, go to Settings > Update & security > Windows Update. 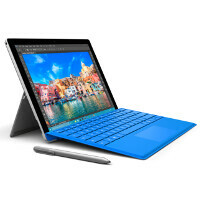 The Surface Pro 4 update should fix any issues you are having with problems to system and display stability, battery life, screen rotation and more. Hopefully, your device will be running just the way you want it to be following the update. Intel Smart Sound Technology (Intel SST) Audio Controller driver update (v8.20.0.866) improves system stability. Intel Smart Sound Technology (Intel SST) OED driver update (v8.20.0.866) improves system stability. I wish they would have this available in our region, such a nice hybrid laptop/tablet. Functionality and Productivity at it's finest. Is anyone else having weird sleep issues with windows 10. If I close the lid on my laptop, it doesn't go to sleep, but just hibernates. I have tried all possible settings, but it just wouldn't go to sleep. It isn't a hardware issue as ubuntu sleeps just fine on the same laptop. My Gigabyte Brix Pro doesn't have this issue nor does my roommates junker laptop, my assumption would be that it's a driver issue. Have you tried going with the manufacturer drivers for your computers hardware instead of the ones installed by default by Windows 10? Tyrion is talking about a computer, not a surface. Tyrion's problems happen on all laptop not just Surface. A work around is to disabling hibernate, under command line; cmd powercfg/h off follow by creating a shutdown batch file. Shortcut it to taskbar for convenient; shutdown.exe /s /t 00 Not perfect but suit my purposes. Which has what to do with anything discussed here? Do you even realize how idiotic that is to use as a point? Yeah, you have a locked down set of hardware with little to no variation, so of course the software written for it's going to work! He just wanted to emphasized he's using a fruity. No problems on mine, my setting is "Do nothing" when closing the lid. Well yes, but the issue is that Tyrion wants it to sleep when the lid is closed and it's not doing that correctly. Don't even bring iPad Pro as a comparison. Some thing that sheeps like. I have a dell xps one-27 in my basement. A Nexus 6P as a personal line, iPhone 6s Plus as a work line, and an iMac 5K at work. I've owned the Lumia 920, S3, G3 & S6 Edge in the past, as well as the Note 5 (very briefly, I sold it to my brother and bought the 6P.) I am no sheep or fanboy, yet I love the iPad Pro I'm typing this post on. Why personal preference is such an affront is something I have difficulty wrapping my head around. Different products work for different people.